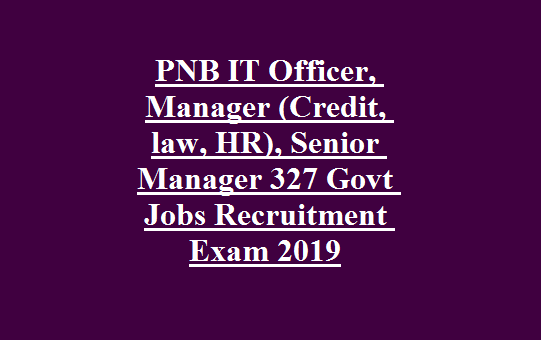 PNB Senior Manager (Credit/law), IT Officer Jobs Recruitment 2019: Punjab National Bank PNB released notification to recruit the various posts in Scale 1, Scale 2 and Scale 3 cadre. There are total 327 vacancies in this PNB Manager recruitment 2019. 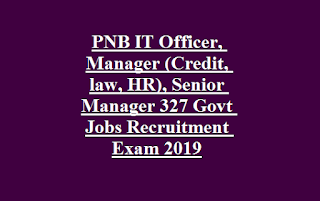 Available posts are Manager (Credit/law/HR), Senior Manager (Credit/law) and IT Officer in this PNB Recruitment 2019. Candidate’s selection for PNB vacancies is on basis of online test (200 Marks) only. Eligible educational qualification & work experience having candidates can apply online for this PNB Senior Manager (Credit/law), Manager (Credit/law/HR) Jobs through official website of www.pnbindia.in on or before 15-02-2019. For more details regarding this PNB Recruitment of Senior Manager (Credit/law), Manager (Credit/law/HR) and IT Officer jobs selection process, exam pattern and syllabus topics, age limits, pay scale, qualification, experience and other information is given below. Senior Manager (Credit): CA/ICWA/MBA/PGDM with Finance and 5 years work experience. Manager (Credit): CA/ICWA/MBA/PGDM with Finance and 3 years of work experience. For all the posts an online test will be conducted for 200 marks. Written exam will be conducted for 200 marks. Exam duration is 120 minutes. Apply online for this PNB Punjab National Bank Jobs Recruitment of Senior Manager (Credit/law), IT Officer and Manager (Credit/law/HR) Posts. Online applications submission last date is 15-02-2019 through official website of PNB @ www.pnbindia.in.